Scores of people on Friday turned up to watch matches at the Changwe Kalale memorial youth football tournament held at the rugby fields in Chambishi. Former Zambia Under-17 star Kalale died last year after sustaining a spinal injury in a road accident in 2014 on his way to the 2015 AFCON pre-tournament camp in Lusaka. Europe-based Chipolopolo players Patson Daka and Enock Mwepu officially opened the tournament and paid tribute to their departed colleague Kalale. “I just want to thank everyone who has made an effort to come here to celebrate the life of Changwe Kalale. He is gone but not forgotten. He is still in our hearts,” Daka said. Kalale inspired the Zambia Under-17 to its debut U17 AFCON qualification in 2015 in Mali but missed the tournament due the injury. “We are here to honour Changwe Kalale. He grew up here in Chambishi and played in this pitch. We are also here to inspire and motivate young ones,” Mwepu said. The Daka 11 and Mwepu 11 teams in which both players featured opened the tournament with a 1-1 draw before eight Under-17 teams fought for honours. Meanwhile, the unveiling of the tombstone at Kalale’s grave will be done Saturday. This is what true brotherhood is all about….let’s have more of such minds and indeed with little efforts we can make Zambia a better place…..big thumbs to you Daka and Mwepu, such humble souls….we thank you for the gesture..
Those 2 boys are disciplined, so mature. Hope Kamanga will not mess their career. 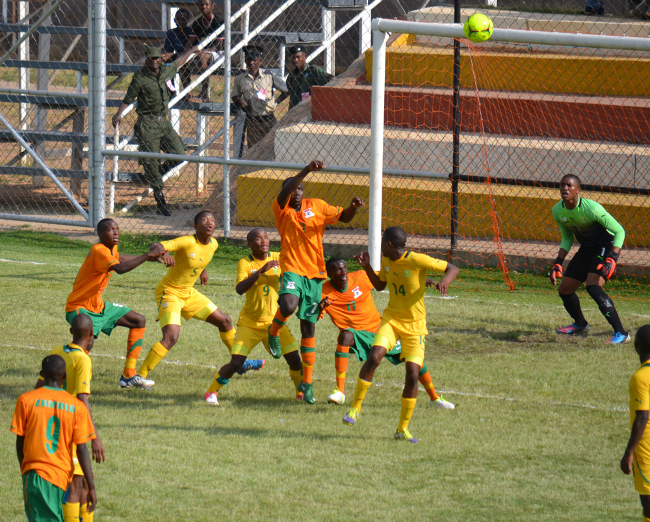 FA Z technical director, Janny Sikazwe would have been at that tournament, but he was dragged down in mud. Quite humbling gesture. Even in death we can continue to be friends. Second time i have been impressed today by people displaying selfless actions,first i overhead a young man at Chris Corner in Chilenje expressing sadness that his elder brother was so sick he could not even take a bath,then he says “..nayenda nibasambike nangu bani kanina”,i was so touched,right now we have a useless lot leading us greedy fools who only think of themselves so it is touching to note that we still have brothers keepers among us,big ups young men Patson and Enock.. This is rubbish, NO MEANING , WHY NOT JUST PAY RESPECTS BY GOING TO FAMILY WITH CASH ? DAKA AND MWEPU ARE NOT KNOWN IN SOCCER MAYBE FAZ WAS BETTER PLACED TO ORGANIZE A MATCH FOR OUR DEPARTED HEROES OF 1993, KA DAKA AND MWEPU WHO GAVE U POLICE PERMIT TO ENTER CHAMBESHI TOWN WITH BACKWARD MINDS?